the Model 345 is the horn to get! It has 69 different sounds to choose from, (9) animals, HEN - BULL - HORSE - SHEEP - ROOSTER - FROG - DOG - DUCK - CAT, (10) sirens, (50) musical songs. 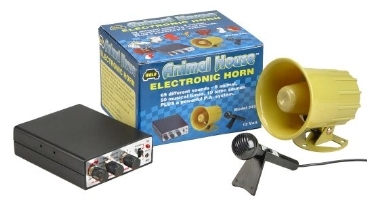 Plus use the microphone to convert the Model 345 horn into a powerful P.A. system- great for sports events, etc. Features a volume control to allow the user to adjust to any level from soft to super loud. Built with the latest state-of-the-art electronics for years of dependable service. Easy to install in all 12 volt vehicles. Kit comes complete with control unit, plastic weatherproof speaker and a P.A. microphone. Instruction in English / Spanish.